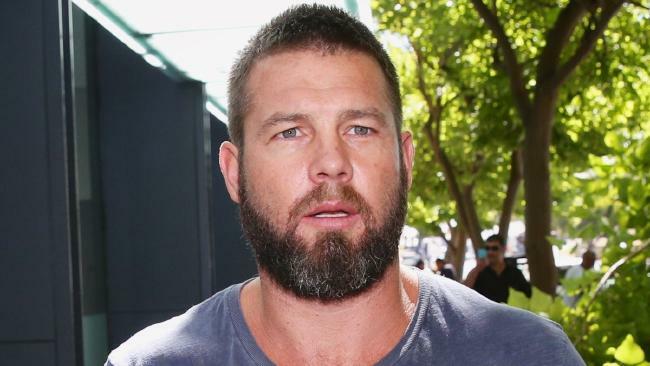 A “DEVASTATED” Ben Cousins will consider a Supreme Court bid to be released from maximum security prison as authorities last night said he would receive no special treatment behind bars. Cousins’ lawyer Michael Tudori told The Sunday Times he would consider this week making a bail application in the Supreme Court. Mr Tudori also said he would try to negotiate to have some of the charges dropped, particularly the “heavy-handed” stalking allegation. “He’s absolutely devastated he’s been remanded in custody. He wasn’t trying to harm anybody … all he’s wanted to do is see his children … any father would have done what he did,” Mr Tudori said, adding he believed his client would be “fine” coping with prison life. Yesterday, Cousins’ former Richmond coach Terry Wallace told of his fear the fallen football hero would be “crawling up the walls”, as drug experts said strong withdrawals would hit at the 10-day mark. “It’s just very sad in general how this had played out. He’s had so many chances but we also know when drugs get you, it doesn’t matter who you are, he just hasn’t been able to beat it at all,” Wallace told Melbourne’s SEN radio. “I can remember when he was with us at the Tigers … I brought the boys around for a barbecue and a backyard cricket game and him being confined into my backyard, he was like a caged lion … he just couldn’t handle the confines of being closed up at all. The Brownlow medallist is believed to be at Hakea Prison after a magistrate refused him bail. Corrective Services Minister Joe Francis yesterday said Cousins would be “treated just like every other prisoner”. “However, obviously he has a profile and that will be considered in managing his safety. But other than that, mainstream prison population, prison greens — nothing special for him mate,” Mr Francis said. Cousins was arrested on Thursday night and charged with seven counts of breaching a violence restraining order taken out against him by his former partner and mother of his two children, Maylea Tinecheff, as well as aggravated stalking and possessing 8g of methamphetamine. He was remanded in custody for at least the next two weeks. Mr Tudori told court on Friday Ms Tinecheff was manipulating the restraining order by “using Cousins when it suits her and when it doesn’t she contacts police”. He said one example was Ms Tinecheff requesting tickets from Cousins to Bruce Springsteen’s Perth concert last month, which they attended together and sat in the front row. Drug rehabilitation counsellor Tabitha Corser, program director at Whitehaven Clinic, said there was not a lot of support for meth-addicted inmates on remand, besides prescribing them anti-depressant medication. “For the first three days, they’re exhausted so they’ll either be sleeping or have extreme insomnia. Around the 10-day mark, really strong cravings hit and then again at 28 days and then again for some at 90 days,” she said.